Very often though, we feel we don’t have the time for kind gestures, despite our best intentions. These 35 ideas are just some quick things we can do to practice this essential part of our faith. 1) If someone owes you money, call or email them to extend the time they have to pay you back, or forgive the debt altogether. “If anyone would like Allah to save him from the hardships of the Day of Resurrection , he should give more time to his debtor who is short of money, or remit his debt altogether” (Muslim). 2) Teach a child one short verse of the Quran. “The best of you are those who learn the Quran and teach it to others” (Bukhari). 3) Plant something edible. “If any Muslim plants something or sows seed from which a man, a bird, or an animal eats, it counts as a charity for him” (Bukhari, Muslim). 4)Say something that will help make peace between two people. 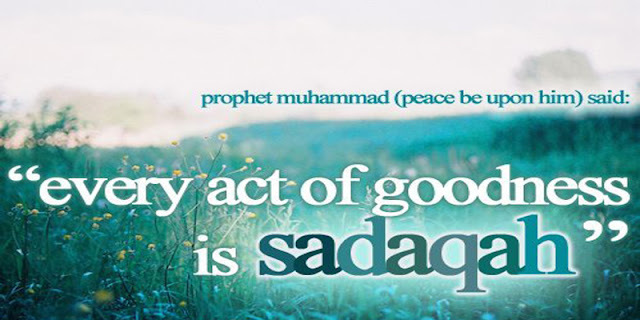 This is considered an act of charity (part of a Hadith in Bukhari and Muslim). 5) Pour water into someone’s glass or get someone a glass of water. This is also considered an act of charity. 6) Offer a glass of lemonade on a hot day or hot chocolate on a cold one to the delivery person or mailman/mailwoman. 7) Help a person load their grocery bags or stuff into their car, or help them mount the bus or train (Bukhari, Muslim). 8) Say something nice to someone else as, “…a good word is charity” (Bukhari, Muslim). 9) If you find debris on the road or highway, remove it or call the local number to inform the state’s highway patrol about it so others won’t be harmed. Removing harmful things from the road is also a form of Sadaqa (Bukhari, Muslim). 10) Text a parent, spouse, child, or friend to tell them you love them. 11) Order a gift online. “Exchange presents with one another, for they remove ill feelings from the hearts” (Tirmidhi). 12) Call or email someone’s boss or supervisor about good customer service you received from a waiter, nurse, mechanic, teacher, etc. 13) Write a glowing online review of a business you’ve had a good experience with. 14) Stop backbiting in its tracks by changing the subject during a conversation. 15) Call to set up a cleaning appointment for a sick or elderly relative or friend. 16) Take out the trash for your elderly or sick neighbor. 17) Let someone go in front of you at the checkout line when getting groceries. 18) Give a good tip. 19) Hold the door for someone. 20) Give up your seat for someone, especially an elderly person. “He is not of us who does not have mercy on young children, nor honors the elderly" (Tirmidhi). 21) In terms of the latter part of the above-mentioned Hadith, stop yourself from scolding a kid who’s done something naughty but harmless. 22) Write and mail off a handwritten thank you card. 23) Smile and say “have a nice day” to a homeless person. 24) Let another driver take that parking spot. 25) Defuse tension by cracking a clean joke. 26) Smile. It’s Sunnah and good for your health. 27) Make a positive Dua for someone you can’t stand. 28) Say Salam to someone you’ve seen around but don’t really know. “You should provide food, and greet both those you know, and those you do not” (Bukhari, Muslim). 29) When you get home, say Salam to your family. “When you enter your home, greet your family with the salutation of ‘Assalamu alaikum’. This will be a source of blessings for you and your family” (Tirmidhi). 31) Make an online donation to a cause or charity dear to a family member or friend. 32) Bite your tongue and stop yourself from saying something unkind. 34) Complete a short task one of your parents asked you to do, whether it’s taking out the trash, emailing a relative, or doing some research about a product or medicine they need. 35) Hold a crying baby so its parent can get five minutes to relieve their stress a bit.